KIITEE Syllabus 2019 Pdf: Kalinga Institute of Industrial Technology Entrance Exam (KIITEE) is a university entrance exam conducted every year for the aspirants who wish to take admission into the various courses offered by KIIT (Kalinga Institute of Industrial Technology). KIIT will conduct the entrance exam i.e. KIITEE 2019 to offers admission for the academic session 2019-20. Candidates, who are thinking to appear in this exam, can check the KIITEE Syllabus here. The syllabus is available on the university official site also. It will be helpful to all candidates, as they can qualify the entrance exam by obtaining the highest marks. Here we have provided the KIITEE Subject wise Syllabus released by the university officials. 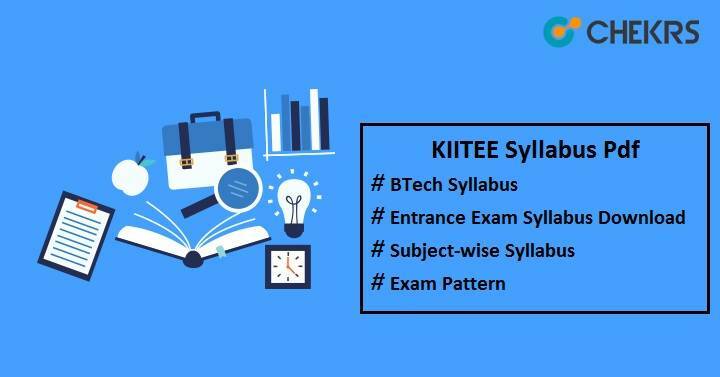 Candidates who are going to pursue their career in the field of engineering & technology can start their preparation now by knowing the KIIT BTech Entrance Exam Syllabus provided here. It includes all the topics covered by Physics, Chemistry & Mathematics. Check the KIIT Entrance Exam Syllabus of BTech course in the table given below.